Globally, more than 75 million person-years of productive life are lost because of preterm deliveries (PTDs), which is mainly a consequence of early mortality and lifelong disability. At present, prematurity has been noted to be the most common cause of under-five mortality globally, well above pneumonias, and malaria. Prematurity is among the major diseases that affect neonates that prevented the achievement of millennium development goals-4 targets that reduction by two-third child death in this part of the world. The survival chances of babies born preterm vary significantly depending on where they are born., The risk of neonatal death due to complications from prematurity is at least 12 times higher for sub-Saharan Africa and Asia than for European preterm babies. Prematurity can be classified based on gestational age as extremely preterm (<28 weeks), very preterm (between 28 and 32 weeks), moderate (between 32 and 34 weeks), and late preterm (34 to <37 weeks). Approximately 45%–50% of PTDs follow the spontaneous onset of labor, 30% follow preterm rupture of membranes, and 15%–20% of preterm births are provider initiated. Furthermore, the earlier in gestation that PTB occurs the greater the risks of adverse outcomes; however, infants born late preterm (35–36 weeks' gestation) still have considerably higher morbidity and mortality compared to their term counterparts. While the etiology of spontaneous preterm birth is heterogeneous and poorly understood, many maternal factors are known to increase risk, such as age (adolescence and advanced age), race, multiple pregnancy, short interpregnancy interval, infections, medical conditions, poor nutrition, lifestyle factors, psychological factors, and genetic predisposition. About 50% of neonatal deaths in Nigeria are related to preterm birth, and of the survivors, 10%–15% have significant handicaps., The common complications encountered in these group of patients include severe morbidities such as respiratory distress syndrome, intraventricular hemorrhage, and bronchopulmonary dysplasia, and necrotizing enterocolitis are far more common in preterm than in term infants., Furthermore, some of these morbidities are not limited to the immediate postdelivery period, as long-term sequelae such as cerebral palsy, visual, and hearing impairment are also more common in preterm infants. The prevention of prematurity may be the most important problem facing maternal and child health-care provider. Continued efforts at risk identification, accurate and early diagnosis, and proper intervention hold the most promise for the prevention of preterm delivery. A number of strategies have been developed, which include identification of women who are high risk for preterm labor and delivery, so that appropriate intervention strategies could be instituted early before significant cervical changes, to ensure the success of the prevention strategies.,,, There is a paucity of data/statistics of prematurity in Nigeria like in most of the resource constraints setting, and the frequently quoted statistics on preterm births and premature newborns are from developed economies of Europe and North-America which showed declining indicator of neonatal problems and do not represent the burdens of prematurity in these parts of the world. We, therefore, conducted this study to determine the characteristics and predictors of prematurity and preterm birth survival at the University of Maiduguri Teaching Hospital (UMTH), Northeastern Nigeria. This retrospective study was conducted on all preterm babies admitted between January 1, 2008, and December 31, 2015 (for 8 years' period) at the special care baby units (SCBU) of the Department of Paediatrics, UMTH. Information were obtained on all neonates delivered in the center or referred to the center for various conditions who were born before 37 completed weeks of gestation. The SCBU is run by three consultants, one senior registrar, a registrar, and interns and four nursing staff on each shift. The gestational age of each newborn was determined by 1st day of the last menstrual period or first-trimester ultrasound scan where mother had antenatal care. Those delivered to unbooked mothers, Ballard maturity rating score was used to determine the gestational age. Data were extracted from the folders of all preterm babies that were managed in the SCBU and entered into the spreadsheet, and the sociodemographic characteristics of mothers included mothers age, booking status, previous preterm birth, educational and employment status, fathers age, educational and employment status, and place of delivery. Also obtained from the mother were a history of illness during pregnancy such as preterm premature rupture of amniotic membrane, antepartum hemorrhage, preeclampsia, eclampsia, pregnancy-induced hypertension, and urinary tract infection among other obstetric problems. Data obtained from the babies were birth order, mode of delivery, type of gestation, birth weight, Apgar scores at 1, 5, and 10 min after birth, respectively, difficulty in breathing, apnea, fever, and feeding problems among other problems. Ethical clearance was obtained from the Institution's Ethics and Research Committee. Patient's identities were maintained according to the Helsinki declaration of the code of ethics of 1945 as amended on a study involving human subjects. The data were entered into the spreadsheet and analyzed using Statistical Package for Social Sciences (SPSS) version 16.0 for Windows (SPSS Inc., Chicago, IL, USA). Frequencies, means, and proportion of variables were computed. The association between categorical variables was determined using regression analysis or Fisher's exact test where appropriate. 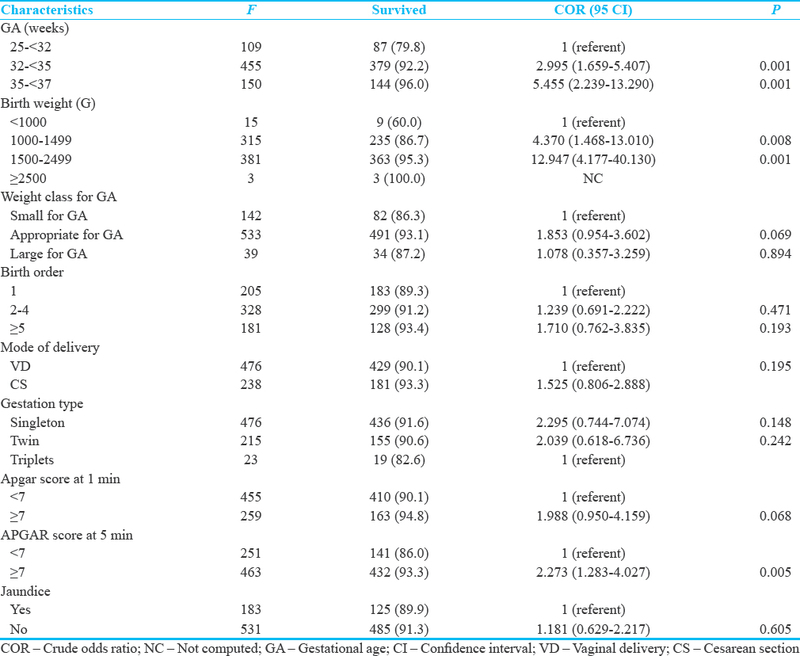 The results were reported as adjusted odds ratio (OR) and 95% confidence intervals (CI). For analyses, P < 0.05 or 0.02 for adjusted regression was considered statistically significant. There were 3435 admissions to the SCBU during the study; out of this, 1129/3435 (32.86%) were preterm babies putting the burden at 32.9%. During the study, there were 3429 deliveries in the study center, and of these, 734 were PTDs, and thus, the preterm birth rate is 734/3429 (21.4% or 203/1000 live birth). Of the 1129 preterm babies managed in SCBU, 714 cases were analyzed. Male preterm babies were 372 (52.1%), while female preterm babies were 342 (47.9%), with the male-to-female ratio of 1.09:1. Extreme low birth weight (<1000 g) was 17 (2.3%), very low birth weight (1000–1499 g) was 288 (40.3%), whereas low birth weight (1500–2499 g) was 406 (56.9%). [Table 1] shows the unrefined regression of sociodemographic factors on PTD outcomes. None of the groups in the sociodemographic characteristics demonstrated a significant association. 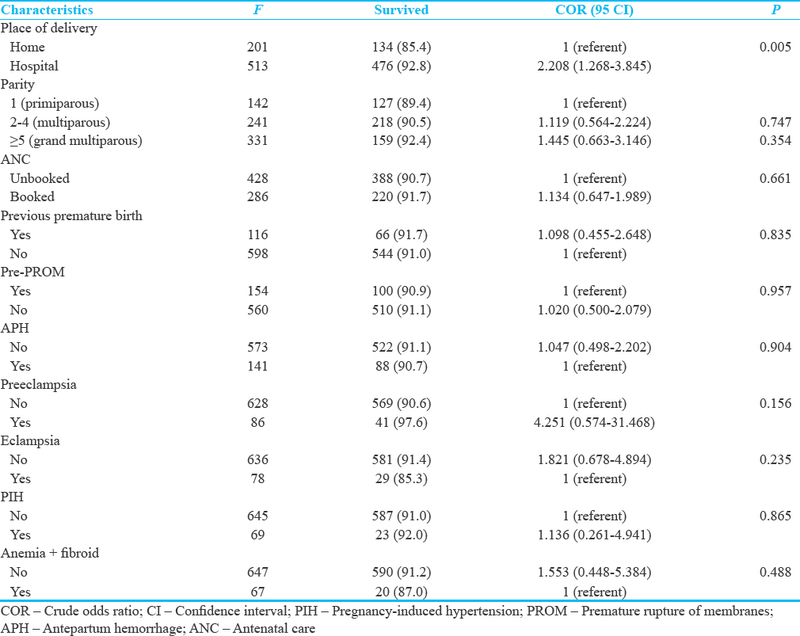 [Table 2] presents unadjusted regression of maternal obstetric factors predicting PTBs outcomes. 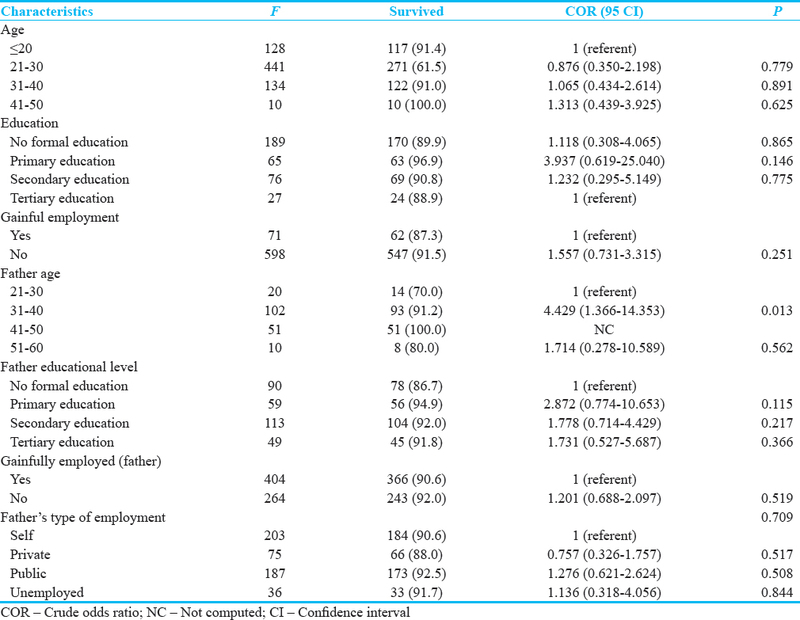 The place of delivery (P = 0.005) was the only maternal obstetric characteristics showing association with survival of PTBs while other factors as shown in [Table 2] demonstrated no association with PTBs survival in the first 6 weeks of life. This crude analysis showed that PTBs delivered at the hospital were 2.2 times more likely to survive than those delivered at home. [Table 3] shows the unadjusted analysis of neonatal factors predicting survival of PTBs during the hospital admission and up to or beyond the first 6 weeks of life. Neonatal factors including gestation age (GA) (P = 0.001), birth weight (P = 0.001), and Apgar score at 5 min demonstrated association with survival of PTBs in the first 6 weeks of life and beyond while other neonatal factors including birth order (P = 0.420), mode of delivery (P = 0.195), gestation type (P = 0.148), Apgar score at 1 min (P = 0.068), and jaundice (P = 0.605) showed no differences with survival of PTBs in their first 6 weeks of life. Similarly, when survival other weight categories (1000–1499 g and 1500–2499 g) were compared with reference weight category (<1000 g), it showed approximately 4.4 and 12.9 folds survival chances, respectively, of the reference weight category. PTBs without asphyxia at 5 min (Apgar score ≥7) were 2.3 times more likely to survive than those with asphyxia at 5 min. [Table 4] presents adjusted regression analysis of factors predicting survival of PTBs in the first 6 weeks of life. When factors with P < 0.1 in all crude analysis were adjusted in a multivariate regression analysis, weight class for GA (P = 0.108), and Apgar score at 1 min (P = 0.552) did not demonstrate independent association with PTBs survival while other factors including GA (P = 0.033), birth weight (P = 0.024), duration of incubator care (P = 0.001), place of delivery (P = 0.034), and Apgar score at 5 min (P = 0.018) showed independent prediction of PTBs outcomes. Compared with the PTBs born between 25 and <32 weeks, babies born between 32 and <35 weeks and 35 and <37 weeks were 2.2 and 4.1 times, respectively, more likely to survive the first 6 weeks of life and beyond. When compared to PTBs with birth weight <1000 g, babies with birth weight between 1500 and 1499 g were 6.5 folds more likely to survive. For the duration of incubator care, the longer PTBs survived the incubator care the more likely they survived the first 6 weeks and beyond after birth, with reference as duration of incubator care of <7 days, and babies with duration of incubator care of 7–<14 days and 14–<28 days were about 3.5 times and 6.2 times, respectively, more likely to survive. Babies born in hospital were 2.2 times more likely to survive than those born at home. PTBs born without asphyxia (Apgar score at 5 min >7) were about 2.3 times more likely to survive their first 6 weeks of life. The pertinent problems that are persistent in the developing countries are the paucity of data and lack of thorough and comprehensive reports on the burden of preterm births and preterm babies., Unlike the developed society where reliable statistics are present and give a relevant data, so that, it guides every decision about care of preterm babies. In this study, the burden of premature births and preterm babies was much higher (32.9%) compared to the findings (15.4%) reported by Oluwafemi and Abiodun from Ondo State, South-west (18.5%), by Oluwafemi et al. from Lagos, also South-western Nigeria (24%), and by Kunle-Olowu et al. from Niger Delta, South-south Nigeria and other reports include (23.7%) by Onankpa and Isezuo from Sokoto North-western Nigeria and (31.3%) by Onwuanaku et al. from Jos North-central Nigeria. The preterm birth rate in our facility 20.37% was higher than the reported birth rates of 16.8% by Butali et al. from Lagos and 12% by Mokuolu et al. from Ilorin and was equally higher than the national preterm birth average of 15% for Nigeria. This finding was, however, far lower than (54.9%) reported by Ambe et al. from the same over a decade ago. The reason for the differences is not clear even though apart from the study by Ambe et al. who collected data over 4 years, most of the rest of the study were over short period with smaller samples; however, we speculate that the difference might be due to study protocol, geographic, and selection methods among other reasons. In this study, maternal sociodemographic characteristics crude regression analysis did not demonstrate significant association with preterm babies care outcome. However, there was low survival among preterm babies delivered to mothers of age range of 21–30 years. When compared, place of birth (OR = 2.208, 95% CI = 1.268–3.845, and P = 0.005) demonstrated that those babies delivered at a hospital were associated with high survival rate. Other maternal obstetrics characteristics did not show significant association with outcome of care of preterm babies in our center. The findings in an unadjusted regression analysis of the neonatal factors that were predictive of outcome include gestational age between 32 and 35 weeks of 455 preterm babies, 379 (92.2%) survived (OR = 2.995, 95% CI = 1.659–5.407, and P = 0.001), age between 35 and < 37 weeks, with 150 preterm babies, and 144 (96.0%) survived (OR = 5.455, 95% CI = 2.239–13.290, and P = 0.001). Birth weight, 1000–1499 g, 315 of which 235 (86.7%) survived (OR = 4.370, 95% CI = 1.468–13.010, and P = 0.008), birth weight range between 1500 and 2499 g with number of 381 preterm babies, 363 (95.3%) survived (OR = 12.947, 95% CI = 4.177–40.130, and P = 0.001). Furthermore, another important factor predictive of preterm baby's outcome was the Apgar score of >7 at 5 min at birth which had an improved survival, out of 463 preterm babies 432 (93.3%), with an independent association (OR = 2.273, 95% CI = 1.283–4.027, and P = 005). This finding compared favorably with reports by Butali et al. and Oluwafemiand Abiodun. This report was in contrast to the report by Ambe et al. from the same center over a decade ago and that by Onankpa and Isezuo et al. from Sokoto Northwestern Nigeria.. This difference may be because of expansions achieved over time since then in terms of equipment, more incubators, radiant warmers, and improved skilled workforce in the unit. Furthermore, at the same time, his report was over a period of 4 years compared to our report of over 8-year period. While the study by Onankpa et al. was just a 1-year report which have weaker statistical strength. When the factors with P < 0.1 in unadjusted regression analysis were adjusted in multivariate regression analysis, factors including gestational age (P = 0.033), place of birth (P = 0.034), birth weight (P = 0.024), duration of incubator care (P = 0.0001), and Apgar score at 5 min (P = 0.018) showed independent prediction of preterm babies outcome. Those babies delivered at gestational age between 32 and <35 weeks' gestation and 35 and <37 weeks' gestation were 2.2 and 4.1 times, respectively, more likely to survive beyond first 6 weeks after birth than those that were born at gestational between 25 and <32 weeks' gestation. Those preterm babies delivered with birth weight between 1500 and 2499 g were 6.5-fold more likely to survive than those with birth weight below 1500 g. The longer the effective incubator care between 7–14 days and 14–28 days, they were about 3.5 and 6.2 fold likely to survive beyond the first 6 weeks after birth compared to those with incubator care <7 days. This we because we have few number of incubators compared to high admission rate of preterm babies to the unit which forces the unit to adopt a policy of transferring out of incubator to a warm cot care to give way to the critical preterm by the way of rationing incubator care. In this study also, preterm babies delivered at hospital and those with Apgar score of >7 at 5 min of life had 2.2 and 2.3 times, respectively, more likely to survive through the first 6 weeks of life. The findings were similar to the reports documented by Akintayo et al. and Ezechi et al., Ekiti and Ile-Ife both from Southwestern Nigeria. However, this finding was contrary to some other reports within Nigeria, and by Wagura et al. other developing country. In this study, we reported an increased survival among preterm babies admitted to our unit, and we felt a significant improvement in the outcome of these babies, especially with the survival of micro-preemie. Similar report was documented by Pharande et al. from Australia a more developed country than Nigeria, definitely we have achieved a better improvement for the fact that it is coming from a resource constraint setting with poor infrastructure to carter for preterm babies. With this improvement in preterm baby survival, we need also to focus on serious morbidities associated with these preterm infants with efforts aimed at reducing them which we believe can be achieved in collaboration with the obstetrician so that mothers of high-risk pregnancies for preterm birth are identified and comanaged early. We believe with focused and optimal antenatal care, use antenatal corticosteroids, robust and effective neonatal intensive care, more preemies can be salvaged even this setting. The burden of preterm birth has remained high (prevalence of 32.9%) even though lower compared to the earlier report, due to downtrend in the economic situation, especially in the Northeastern Nigeria where close to a decade now, conflicts due to insurgency has virtually displaced people from the original place of abode. On the side of the health-care delivery, our health facility has been overstretched yet no additional equipment has been procured put the few equipment at verge collapse. If government and nongovernmental organization support, we could do better and achieve high results than this report. The authors are particularly appreciative of the staff of medical record department, Special Care Baby Unit (SCBU) of the Department of Paediatrics for their support during the study. Liu L, Oza S, Hogan D, Perin J, Rudan I, Lawn JE, et al. Global, regional, and national causes of child mortality in 2000-13, with projections to inform post-2015 priorities: An updated systematic analysis. Lancet 2015;385:430-40. Wagura P, Wasunna A, Laving A, Wamalwa D, Ng'ang'a P. Prevalence and factors associated with preterm birth at Kenyatta national hospital. BMC Pregnancy Childbirth 2018;18:107. Goldenberg RL, Culhane JF, Iams JD, Romero R. Epidemiology and causes of preterm birth. Lancet 2008;371:75-84. United Nations General Assembly. United Nations Millennium Declaration. New York: United Nations; 2000. Butali A, Ezeaka VC, Ekhaguere O, Weathers N, Ladd J, Fajulu I, et al. Characteristics and risk factors of preterm births in a tertiary centre in Lagos, Nigeria. Pan Afr Med J 2016;24:1. National Population Commission (NPC) [Nigeria] and ICF International. Nigeria Demographic and Health Survey 2013. Abuja, Nigeria and Rockville, Maryland, USA: NPC and ICF International. Institute of Medicine (US) Committee on Understanding Premature Birth and Assuring Healthy Outcomes; 2014. Estimates Developed by the UN Inter-Agency Group for Child Mortality Estimation (UNICEF, WHO, World Bank, UN DESA Population Division); 2014. Available from: http://www.wdi.worldbank.org/table/2.21; http://www.childmortality.org. [Last accessed on 2018 Sep]. Howson CP, Kinney MV, Lawn JE, editors. March of Dimes, PMNCH, Save the Children, World Health Organization. Born Too Soon: The Global Action Report on Preterm Birth. Geneva: World Health Organization; 2012. Vogel JP, Lee AC, Souza JP. Maternal morbidity and preterm birth in 22 low – And middle-income countries: A secondary analysis of the WHO global survey dataset. BMC Pregnancy Childbirth 2014;14:56. Stoll BJ, Hansen NI, Bell EF, Shankaran S, Laptook AR, Walsh MC, et al. Neonatal outcomes of extremely preterm infants from the NICHD Neonatal Research Network. Pediatrics 2010;126:443-56. Menon R. Spontaneous preterm birth, a clinical dilemma: Etiologic, pathophysiologic and genetic heterogeneities and racial disparity. Acta Obstet Gynecol Scand 2008;87:590-600. Akintayo AA, Awoleke JO, Ogundare EO, Olatunya OS, Aduloju OP. Preterm births in a resource constrained setting: Sociobiologic risk factors and perinatal outcomes. Ghana Med J 2015;49:251-7. Wen SW, Smith G, Yang Q, Walker M. Epidemiology of preterm birth and neonatal outcome. Semin Fetal Neonatal Med 2004;9:429-35. Marlow N, Wolke D, Bracewell MA, Samara M; EPICure Study Group. Neurologic and developmental disability at six years of age after extremely preterm birth. N Engl J Med 2005;352:9-19. Skeman JA, Rajab KE. 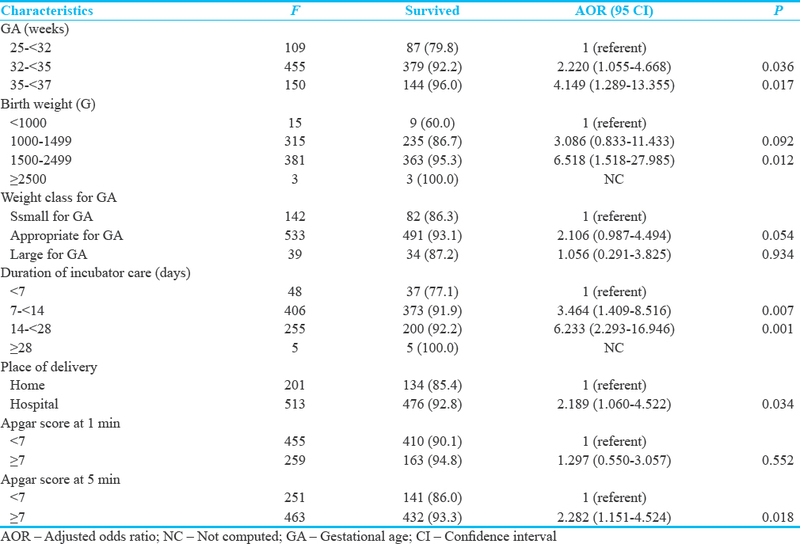 Obstetric, neonatal and anaesthetic consideration for preterm labour and delivery. Saudi Med J 2003;24:582-93. Omole-Ohonsi A, Attah RA. Risk factors of preterm deliveries at Aminu Kano teaching hospital, Kano, Nigeria. South Asian J Manage Sci 2012;1:3-10. Oluwafemi RO, Abiodun MT. Incidence and outcome of preterm deliveries in mother and child hospital Akure, Southwestern Nigeria. Sri Lanka J Child Health 2016;45:11-7. Oluwafemi RO, Njokanma OF, Disu EA, Ogunlesi TA. Maternal factors in aetiology of small-for-gestational age among term Nigeria babies. Niger J Paediatr 2013;40:119-24. Kunle-Olowu OE, Peterside O, Adeyemi OO. Prevalence and outcome of preterm admissions at the neonatal unit of a tertiary health centre in Southern Nigeria. Open J Pediatr 2014;4:67-75. Onankpa BO, Isezuo K. Pattern of preterm delivery and their outcome in a tertiary hospital. Int J Health Sci Res 2014;4:59-65. Onwuanaku CA, Okolo SN, Ige KO, Okpe SE, Toma BO. The effects of birth weight and gender on neonatal mortality in North central Nigeria. BMC Res Notes 2011;4:562. Mokuolu OA, Suleiman B, Adesiyun O, Adeniyi A. Prevalence and determinants of pre-term deliveries in the University of Ilorin teaching hospital, Ilorin, Nigeria. Pediatr Rep 2010;2:e3. Ambe JP, Idrisa A, Usman JD. A review of preterm admissions into special care baby unit, in university of Maiduguri teaching hospital: A four year experience. Niger J Clin Pract 2007;10:229-33. Ezechi OC, Makinde ON, Kalu BE, Nnatu SN. Risk factors for preterm delivery in south Western Nigeria. J Obstet Gynaecol 2003;23:387-91. Pharande P, Abdel-Latif ME, Bajuk B, Lui K, Bolisetty S. Preterm infant outcomes in relation to the gestational age of onset and duration of prelabour rupture of membranes: A retrospective cohort study. BMJ Paediatrics Open 2017;1:e000216. doi:10.1136/ bmjpo-2017-000216. McGil Ugwu G I. Prematurity in central hospital and GN children's clinic in Warri Niger delta. Niger Med J 2010;51:10-3.